Bill O'Reilly recently invited Megyn Kelly on his show, The O'Reilly Factor, to discuss what he calls, "the White Privilege Theory." For those of you who don't remember her name, Megyn was the biggest advocate for Santa Clause's Whiteness, despite the history behind his actual place of origin in folklore. 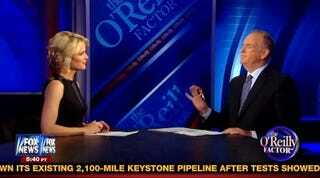 To my suprise (and possibly, Bill's), Megyn ACTUALLY went on a rant in support of White Privilege's existence. The way she expressed Black folks' resounding frustration with the Ferguson events and the dichotomy between races/classes?! Ya'll. It was damn near beautiful. Of course, there were some Demoratic jabs thrown in to keep it Republican cute and she is riding the coattails of the "Mike Brown is no angel" ride, but other than that… she actually admitted it. That White privilege exists. Clap for her.